The intimacy and splendor of the outdoor heated pool at TI is an essential element of any Las Vegas vacation. The double chaise lounges, plush round ottomans, live DJ* and 25 person hot tub provide the finest amenities for socializing with friends over tropical frozen infusions, tasty bites, or simply enjoying some gratifying solo time basking in the sun. * Pool may be open on limited dates and/or fewer hours in Early March and Mid November, weather permitting. Alcholic beverages may only be purchased and consumed in the pool area for those 21 and older with valid ID. No outside alcoholic beverages are permitted to enter the pool area, including those previously purchased at the pool. Any alcoholic beverages exposed during entry security check will be confiscated. Cabana Host Service from 9:00 a.m. to 4:00 p.m.
Reservations required for Full Day pool cabana rentals, call 1-702-894-7487 or toll free 1-800-944-7444. Half Day rentals are based on availability only on the day of use (no advance reservations). 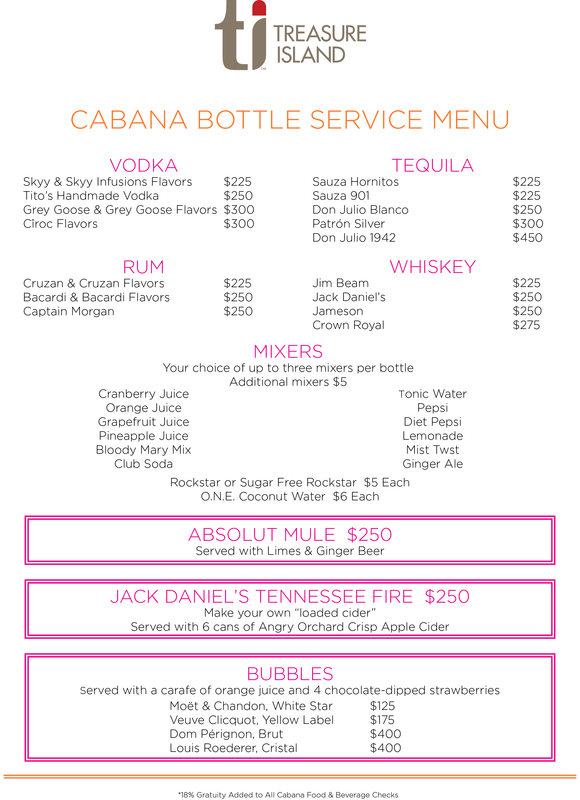 All Cabana assignments are on a first come first serve basis; we are unable to honor requests for specific cabana locations in advance with the exception of the Lanai. Cabana Host service ends at 4:00 p.m. each day. Full day reservations that do not check-in by 11:00 a.m. are considered a no-show cancellation. * Rental fees noted above are per cabana/lanai, per day, and subject to change without notice. Additional surchages may apply during major holidays or special events. 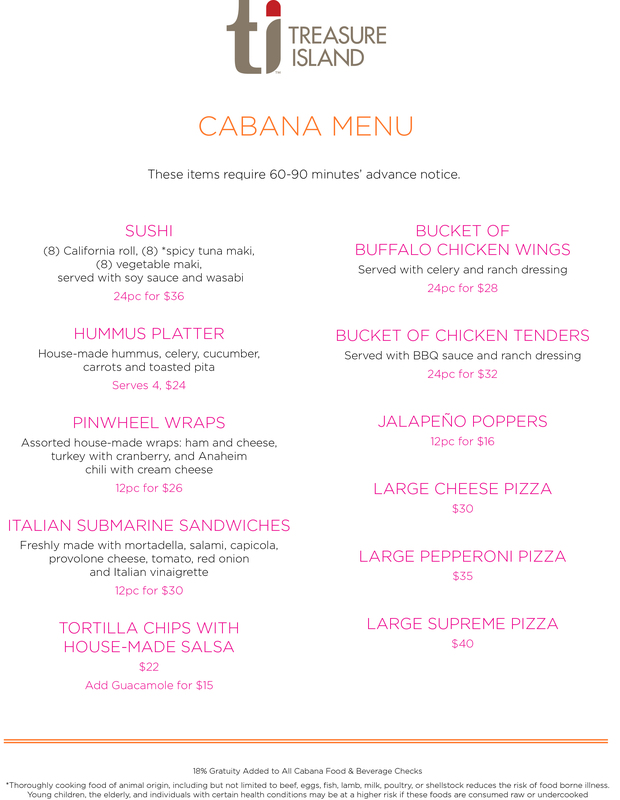 18% Gratuity added to all Cabana Food & Beverage checks. ** In addition to the fees outlined above, there is a $200 food and beverage minimum for Cabanas and half Lanai ($400 for full Lanai) rentals on Friday & Saturday only. TI Day Beds are deluxe oversize loungers featuring extra soft, waterproof padding for your ultimate tanning and relaxing comfort. Daybed rentals also include a bucket of six (6) ice cold waters, and poolside beverage service is provided to purchase other drinks from the bar. Reservations are required for Day Bed rentals. Please call direct 1-702-894-7487 or toll free 1-800-944-7444. * Rental fees are per day bed, per day, and subject to change without notice. 18% Gratuity added to all Daybed Food & Beverage checks. Chill Time with No Music Open to 11:00 a.m.
House Music and/or DJ 11:00 a.m. to 6:00 p.m.
* Pool entertainment is March - October, and all times are subject to change. Adult supervision advised. Looking for a pool party or reception for 20 or less? Rent the LANAI for a truly VIP experience, and choose from multiple food and beverage options. How about a poolside evening reception for more than 20 people? Submit your request using our online RFP, or contact TI Catering & Banquets for pricing and availability. For the best experience to enjoy our live DJ and pool party atmosphere, be sure to rent a cabana. Please note your TI hotel room key and valid hotel guest identification is required to gain access to the pool, and there are no coolers, glass containers and/or any outside food and beverage allowed in the pool area. Cover charges may apply for certain special events. Call direct 1-702-894-7487 or toll free 1-800-944-7444 for additional details.